As an expat; exiled from family and life-long friends, forever barred from the spontaneous ‘pop-round for a cup of tea and a chat’ or the casual catch-up in the street; Skype takes on a different level of importance. It’s not that the occasional buffering, freezing or simple malfunctioning becomes less annoying; if anything, it’s more so. The constant scouring of your online contact list can become rather souring as less Skype-dependent friends fail to sign in and make themselves available on your particular timetable. The first half of every conversation with Grandma, which is spent mouthing and gesticulating at the screen as she hunts her headset before accidentally cutting us off and then mysteriously disappearing offline for an hour, oddly becomes no less frustrating through constant repetition. Or the Friday evening family catch up, where a little step-brother growing up in the mountains of northern Spain can disco dance for his big brother living the twenty-something London life. When the stars align and the internet connection behaves, a relaxed hour spent in each other’s sitting rooms lets us gradually regain the ease that is lost with the absence of daily contact and we reel our relationships back in despite the physical distance. And then there are the times when life pulls the rug out from under your feet. Just before Christmas 2014 Grandma had a sudden, massive stroke and by New Year she was gone. We’d give anything to see her Skype handle pop up in our ‘online’ contact list again. Knowing that it won’t, we don’t resent a single moment of those we spent watching her empty computer chair as she scuttled round her flat looking for that blooming headset. All those missed calls or failed connections, more than lines in our Skype history are so many dropped stitches in the tapestry of our lives together. And the connections that made it, the times that we got to sing silly songs together, catch up on family news or simply bemoan the woes of growing old – for those we are truly grateful. 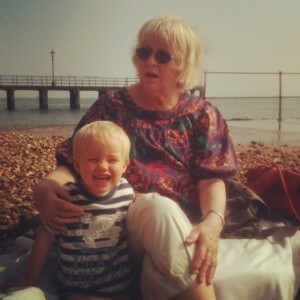 Happy days with Grandma at Hot Walls, Portsmouth. Lovely post and close to my heart – so sorry for you loss.